It doesn't matter how fast your car is, you can only drive as fast as you can see down the road ahead of you. 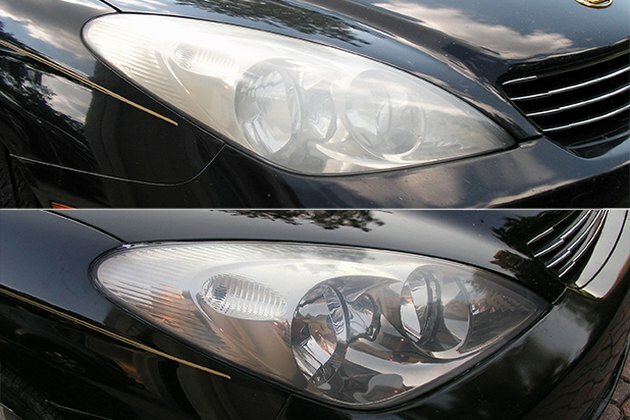 When the plastic lenses on your headlights get hazy and oxidized, they disperse the light and reduce your visibility. Here’s how to clean them. Do one headlight at a time. 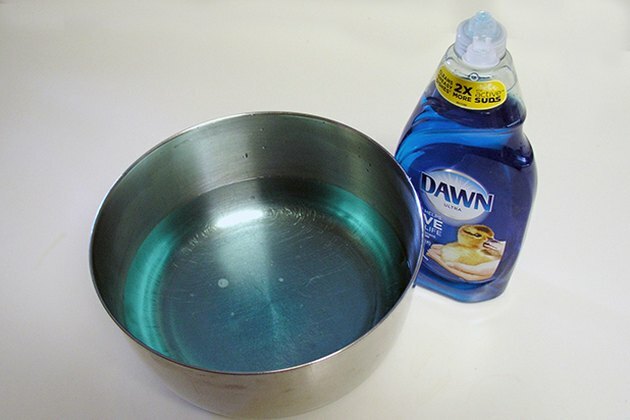 Start by washing the lens and surrounding area completely using dish detergent. Normally you'd avoid harsh detergent because it strips your car’s wax and dries out the paint, but that's what you need in this case. Rinse and allow to dry completely. 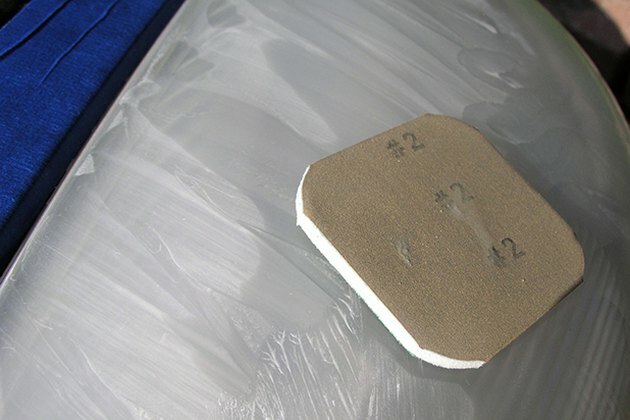 Wrap a strip of 500-grit sandpaper around a foam sanding block or large sponge. The foam helps distribute pressure on the sandpaper so you don’t leave deep gouges in the lens. 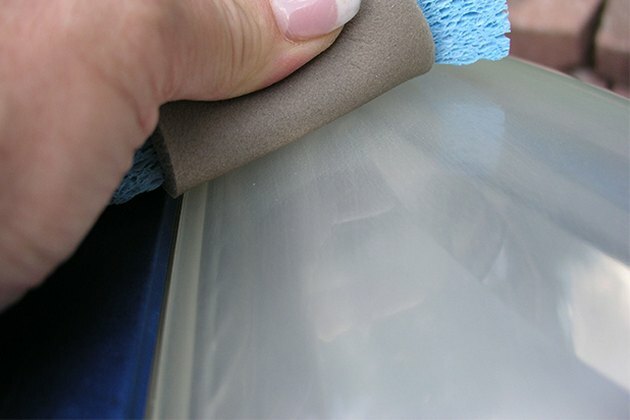 Keep sanding until the surface is uniformly frosty and completely opaque. Keep sanding until it feels as silky smooth as sanded pinewood. 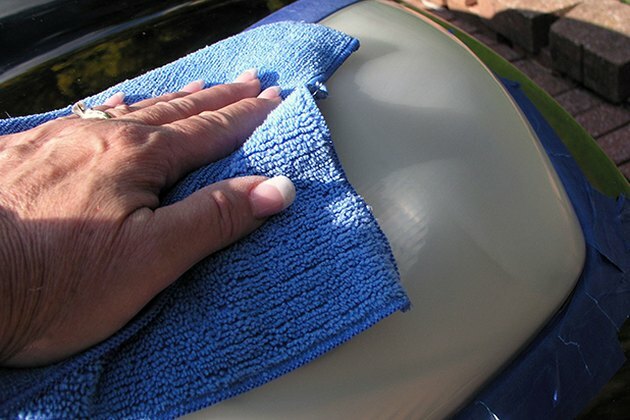 Wipe the headlight down with a microfiber cloth to check your work. Be sure you adequately sanded edges and corners. When you're satisfied, rinse the headlight with clean water. Fill a gallon pitcher with water. 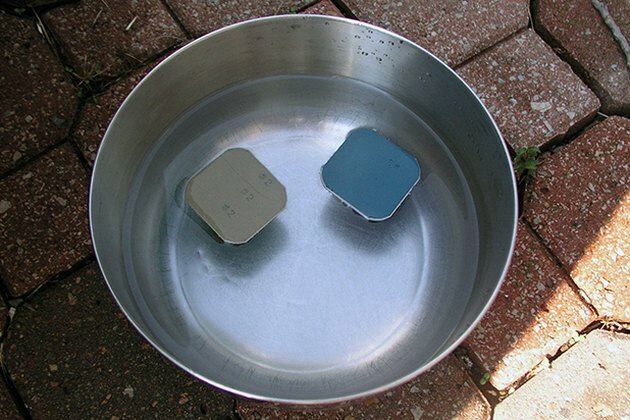 Add dish detergent and drop in a few pieces of 1000- and 2000-grit sandpaper to soak. 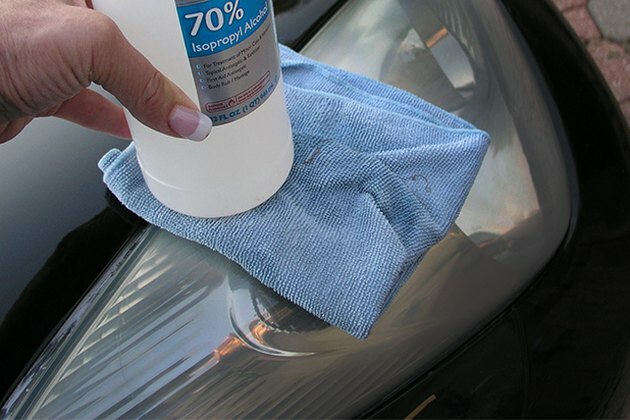 Fill a spray bottle with soapy water from the pitcher and heavily mist your headlight. 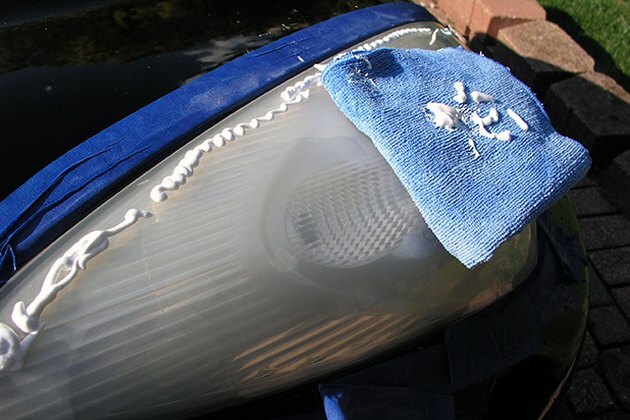 Wrap the foam block 1000-grit sandpaper and sand the headlight just as you did with the 500-grit. Keeping the spray bottle in your other hand, give the lens a fresh spray every time you change sanding directions. Keep it wet and slippery. Sand until the paper slides smoothly over the headlight lens and you can't feel any rough spots. Rinse and dry the lens, preferably with compressed air. Look at the lens from an angle. If you see irregularities, re-wet the lens and keep sanding with a fresh piece of wet sandpaper. Wash, rinse, and repeat with 2000-grit paper. Rinse and dry the lens completely when you're finished. The lens should be almost uniformly clear (with some slight hazing). 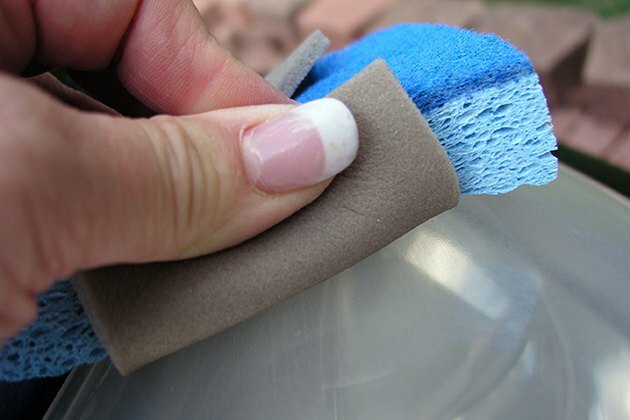 Fold a microfiber polishing rag into quarters. 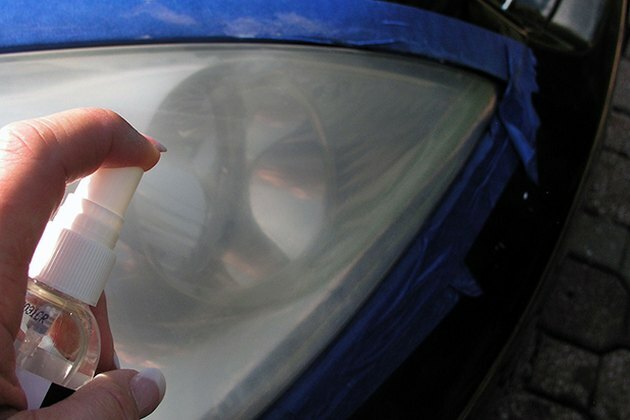 If you're using liquid headlight polish, run a thick line of polish along the top of the headlight. If you're using a paste-type plastic polish, load your rag up with about an ounce and smear it all over the lens. Work the polish all over the lens until it’s covered uniformly, then add a bit more polish to your rag. Polish the lens with medium pressure, using the same method you used while sanding. Make complete passes over the lens, polishing in one direction; then flip the rag over to a cleaner side for another pass. The longer you polish, the better the result will be. Keep going until the surface feels completely smooth and uniform. Note: This will take much longer than you expect it to. 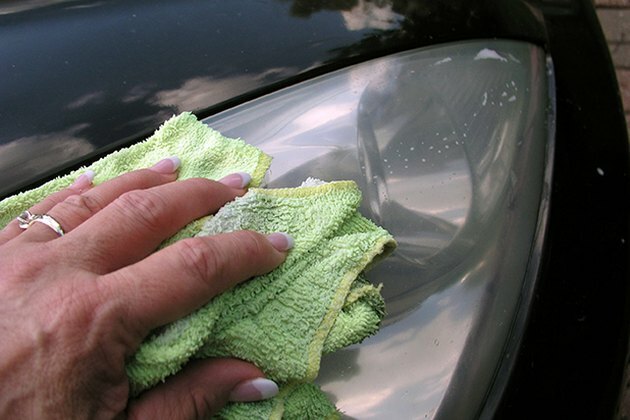 Wash the headlight with detergent water, rinse thoroughly, and allow to dry completely. Wipe the lens down with rubbing alcohol and a clean, lint-free towel. Spray with lens sealer and wipe it with a lint-free towel as directed by the sealer packaging. Step back to admire your work. 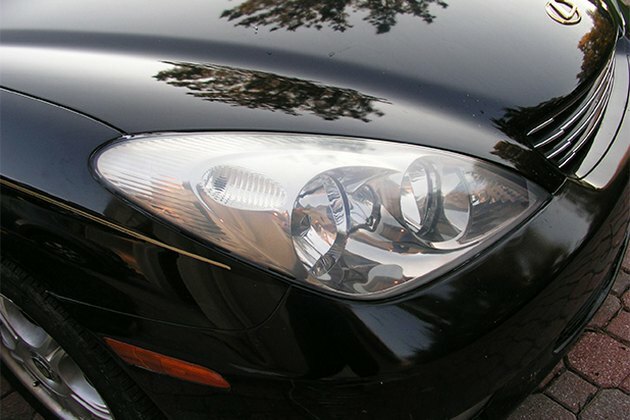 With the lens completely clear and smooth, and the sealer filling in any minor imperfections to form a perfect, glass-like sheen, your headlight should glitter, jewel-like, in the sun. Now repeat all of these steps on the other headlight. You can simplify the process by using a commercially available polishing kit, found in most any auto parts store. These kits come complete with sandpaper, lubricant, and sealer. They are available in two basic varieties: hand-polishing kits and machine-polishing kits (which include a drill fitting for your own electric drill). All come with step-by-step directions. The hand-polishing kits work almost identically to the process outlined above. Avoid using toothpaste or baking soda, which you can find recommended in various places online. 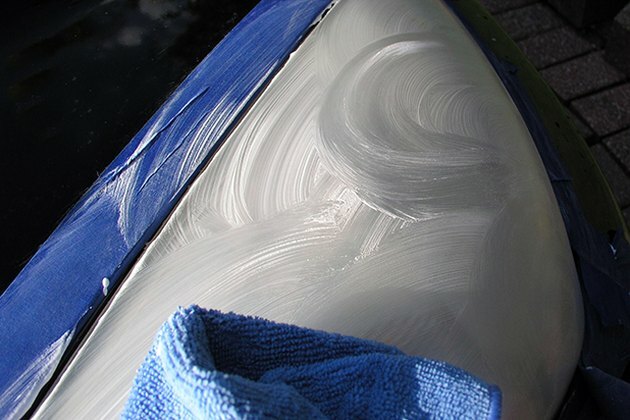 The paste made from baking soda and soap is equal to about 3000-grit polish, is insufficient to really remove oxidation. 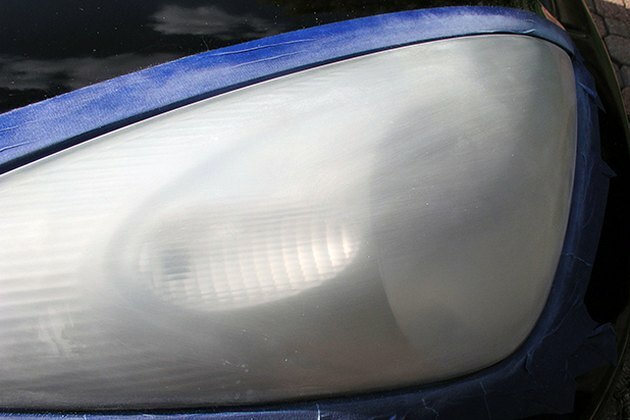 And toothpaste varies from 2500-grit all the way down to 180-grit, which means you could accidentally sandblast your headlight with a paste far too course for your headlights.